A nice playground by the carousel at Golden Gate Park. The playground has slides, swings and is really nice. "The coolest kid's play area we have seen! Bring some card board so the kids can use the cement slides! 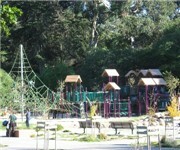 How Would You Rate Golden Gate Park Playground?